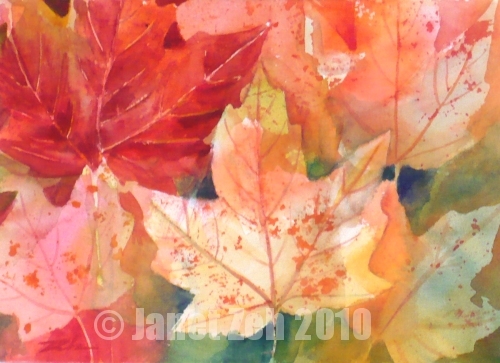 It's great fun to do a painting of leaves. I collected colorful maple leaves from the ground on one of my daily walks and used them as stencils for this painting. I start by brushing paint on the vein side of a leaf,placing it on the paper and, using a wide flat brush, painting out from the leaf to color the area around it. Then I repeat with other leaves letting the paint overlap previous leaves. Finally, I choose which leaves should stand out, add deeper colors around those and add details to the prominent leaves. There is a point at which everything looks like a mess, but once the major leaves are detailed, it is really quite a nice effect! Check out my autumn paintings and prints in my Etsy shop, JanetZeh.Etsy.com. Thanks for stopping by and have a great day!